Golden Globe-winner Jim Carrey, one of the most sought-after guests in "Inside the Actors Studio" history, takes the hot seat on Monday, January 10th at 8pm et/pt on the Bravo network. 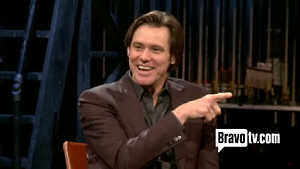 Host James Lipton first invited Carrey 17 years ago to appear on the show and on the night of the memorable taping, told the audience Carrey is worth the "17 years of foreplay." Leaving no stone unturned, Lipton courses through Carrey's early days as a class clown in school to the janitorial job he had to take in order to support his family. Carrey talks about how he developed his character for Ace Ventura and reveals that his technique was similar to Anthony Hopkins method for creating Hannibal Lector. Carrey traverses his career from "In Living Color", "The Mask", "The Truman Show" and his most recent blockbuster hit, "I Love You Phillip Morris", which was just nominated in the category of 'Best Comedy' for the 16th Annual Critics' Choice Movie Awards. Despite the difficulties in accessing clips out- with the USA, Jim Carrey Online is delighted to bring you text from parts of the show and a preview clip courtesy of our new member Sharilyn Johnson. The notes reveal he sat in the interrogation chair for 5 hours, which will be whittled down to a mere 44 minutes of content when the hour-long episode airs on Bravo on January 10. -- Source: Third Beat, Bravo. With thanks to Sharilyn and her friend C.J. Click to comment this article.